Woash Wellness has provided me with Immunity for the purposes of providing an honest review. 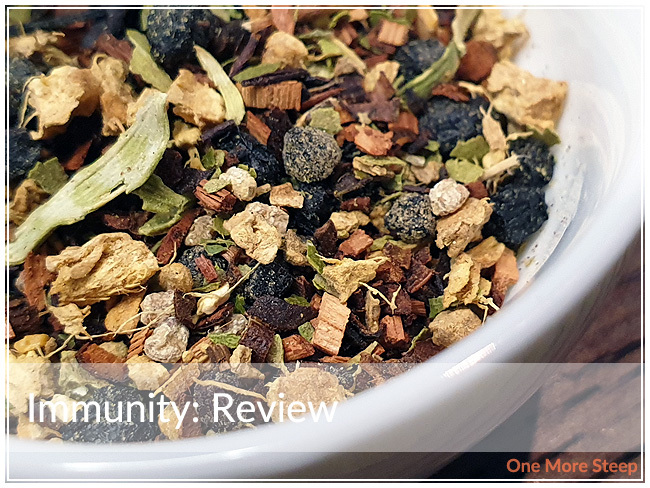 Woash Wellness released their latest herbal blend, Immunity, in January. 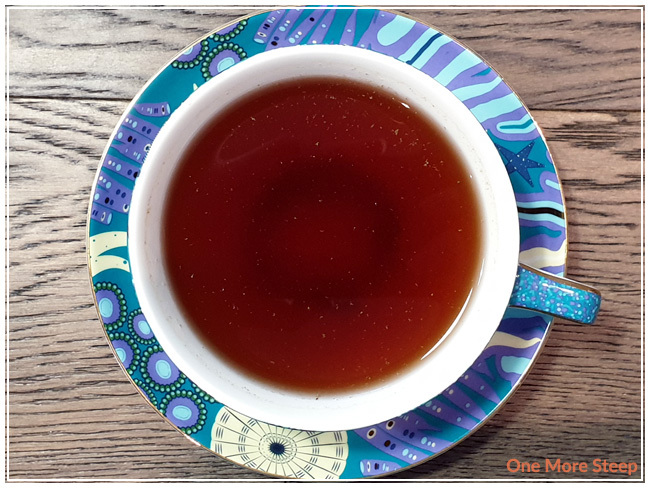 It’s a tisane that is designed to help boost the immune system and help relieve those pesky cold symptoms. As someone who was also very recently feeling sick with a (stupid) cold, Immunity could not have a picked a better time to arrive in my PO box. Immunity comes in a dark blue and cream sealed, resealable bag. The label on the back lists steeping instructions and ingredients. 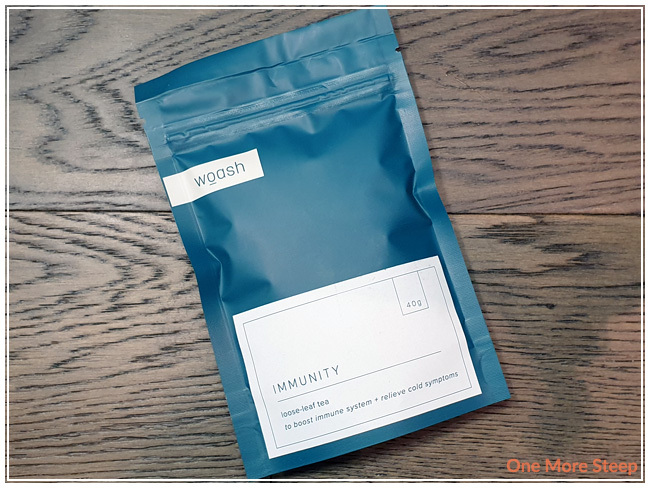 Woash Wellness describes their Immunity blend as being full of vitamin C and antioxidants. The aroma of the Immunity blend is, in short, delicious. It smells a bit like an herbal-ish dessert. I can smell the honeybush, ginger, cloves, and the lemon myrtle. The lemon myrtle gives it a nice citrus aroma, and the combination of citrus and honey fragrances reminds me of some common lozenge flavours. Immunity consists of: honeybush, elderberries, ginger, lemon myrtle, cardamom, and cloves. Woash Wellness recommends steeping Immunity in 205°F (96°C) water for 5 to 10 minutes. Because a lot of herbal infusions don’t do well with a second steep, my initial steep of Immunity was for 10 minutes with 200°F (93°C) water. Immunity steeps to a deep brownish-orange colour. The aroma is primarily that of the lemon myrtle and the honeybush. The citrus and honey notes really do remind me of the cough lozenges I had been using not that long ago. The flavour is a mix of the honeybush, lemon myrtle, and ginger. 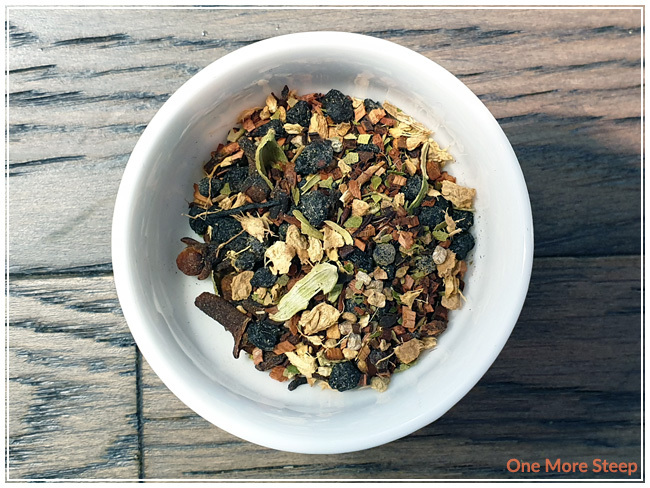 I get the natural warming sensation from the ginger in this blend, which is a quality to have in a blend that’s meant to make people feel a bit better from beig sick. There’s a nice thickened mouthfeel to Immunity, which does a lovely job of coating the mouth, and adds a nice soothing aspect to my poor throat. I attempted to resteep Immunity but found that it didn’t taste as good compared to the initial steep. I loved Woash Wellness’s Immunity. I’ve been actually drinking this almost daily since I picked it up from the post office. While I am getting better on my own, having it to help with my sore throat has been absolutely lovely. 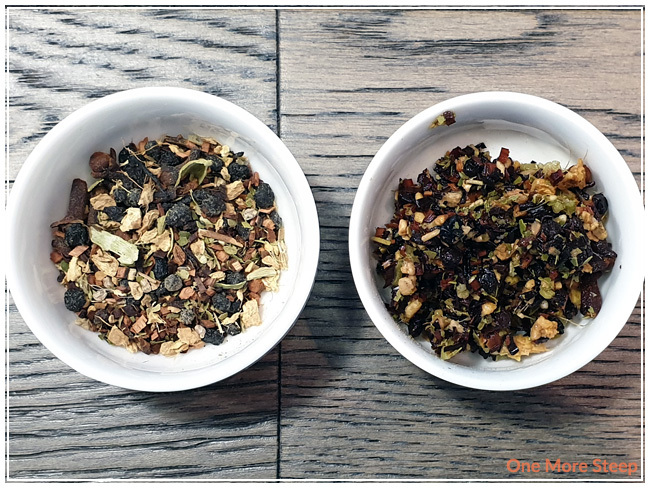 I love the combination of honeybush, lemon myrtle, and ginger – it makes for a tasty blend that both smells and tastes pretty good. If you’re in need of a delicious boost of flavour while sick, Immunity might be a good option for you!